Making their IPE debut, Cory Castle took on CA Elliot. After quite a fight from Castle, Elliot picked up the win. Heavyweight Champion Flex Fenom and J. W. Moringstar vs. OGB and a "Mystery Partner"
After OGB revealed that his mystery partner was none other than Jake "The Machine" Davis, J.W. Morningstar backed out of the match announcing that OGB must face Jake Davis to determine who the #1 Contender will be for the Heavyweight Championship. OGB faced off against Jake Davis only to find out Morningstar had more up his sleeves. During the match Morningstar added a 3rd competitor, Leslie Leatherman, to the mix making the match a Triple Threat. Despite the challenge Leatherman added to the match, Davis pulled off the victory earning him the #1 Contender spot for the Heavyweight Championship. IPE's first women's match found Roxie Cotton taking on Chrissy Rivera. Roxie was able to pull off a victory by pinning Chrissy Rivera. Captain Awesome came to the ring and demanded J.W. Morningstar to give him a match against the Boot Bandit. A mysterious individual who made their first appearance at IPE's October show and attempted to steal Awesome's boot! Morningstar informed the Captain his opponent this evening would not be the Boot Bandit but instead Awesome would face yet another competitor making his IPE debut... Kage! The Boot Bandit sneaked out to the ring and distracted Captain Awesome which allowed Kage to pick up the win. Due to a miscommunication between Hyjinx and Jerkface, Paige ended up getting the pin on Hyjinx. 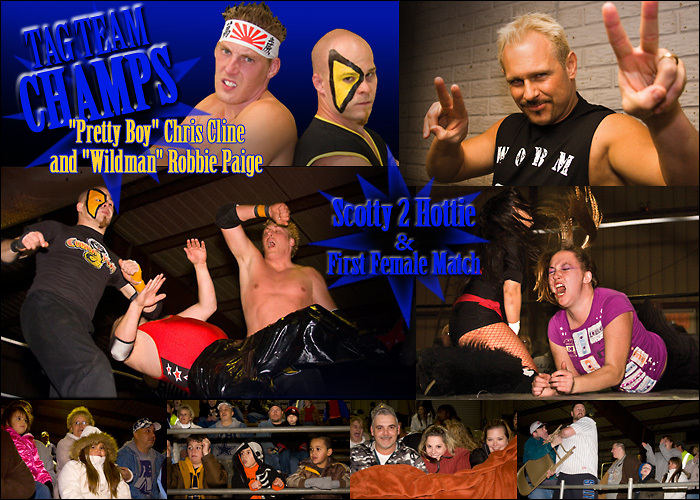 Cline and Paige became IPE's first Tag Team Champions. After the match, J.W. Morningstar and Gutterboy offered Hyjinx and Jerkface a chance to join them. Hyjinx declined and turned to Jerkface in order to shake his hand but Jerkface performed the "Big New Yorker" on Hyjinx. Making it clear to everyone Jerkface had decided to accept the offer. Anthony Odyssey's caddy, Jesse Valentine, tried to assist Odyssey while the ref wasn't looking but accidentally hit Odyssey with a golf club instead. This allowed Tom Cunningham to get the upset win. Flex ducked the Bulldog attempted by Scottie Too Hottie and was able to pick up the win but only by placing his feet on the ropes for the pin. J.W. Morningstar then got involved only to end up in the middle of the ring after getting hit with "The Worm" by Scottie Too Hottie.